It has many fans and works miracles among those seeking hypertrophy: are you ready for a drop set? The world of bodybuilding knows this concept, but the world of sports, in general, is still strange to it. This weight-lifting technique known as drop set guarantees muscular hypertrophy to those who practice it. Drop set, also known as descending sets, was one of the first extensive repetitions techniques that emerged, having gained notoriety primarily among the bodybuilders. A drop set consist in a set that you do as many reps as you can with a certain weight, then you immediately lower the weight to do more reps. There should be as little rest as possible between sets. This is one of the most effective techniques for those who have the goal of increasing their muscle mass. In each set, the weight reduction can oscillate between the 10 and 25% in relation to the load used in the previous set. 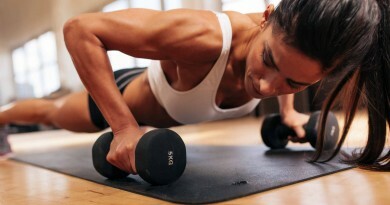 Varying from person to person, each repetition set must start by undergoing a reduction in weight of about 10%. If it is still difficult to complete the number of repetitions stipulated, you can lower the load a bit more to a weight that allow you to complete the exercises to the end. This training method is based on the principle of muscular failure, that is, at the end of each exercises set, the muscles group recruited for this purpose must be completely tired, with the performance in its limit, failing to perform even one additional repetition. This is the point that is reached muscle failure. In this way, it is guaranteed that the largest possible number of muscle fibers that make up the muscle is being used and not left out. When this happens, the muscle is “forced” to grow to meet the demands made by the body. In a drop set training, muscle fatigue is reached more quickly because there are no periods of rest between multiple sets. It reduces the fatigue of muscles and make them continue to perform the exercises due to the reduced weight used. The drop set training should not be undertaken by beginners and implies greater care to be taken in execution of the exercises in order to avoid the appearance of muscle injuries and/or joints of its practitioners. ← Weight training or bodybuilding?